I wanted to try something special for this Sankranthi and found the recipe for Kalkandu (rock sugar/sugar candy) pongal in Kumudham Snegidhi Jan 2011 issue. The recipe was simple and delicious. I adapted the recipe and tweaked it slightly to suit our taste. 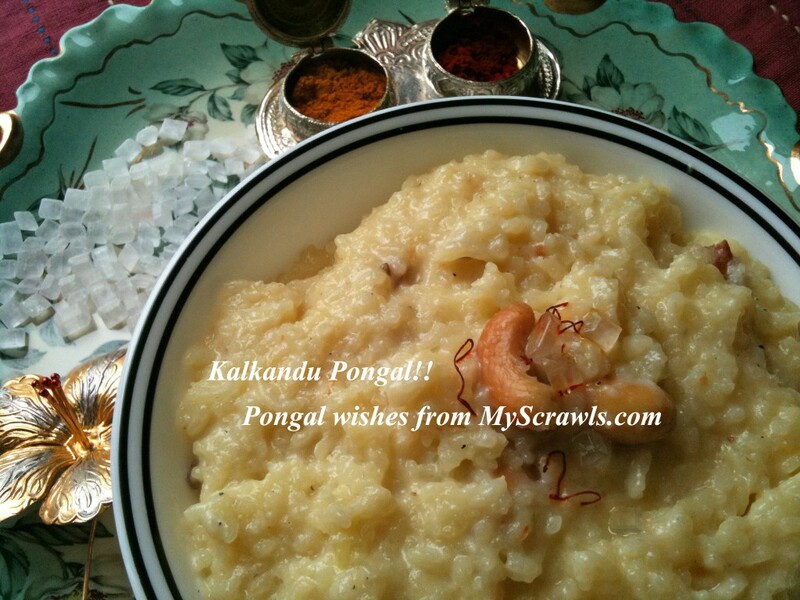 Kalkandu pongal came out very well and we enjoyed the luscious dessert. Note: I have used basmati rice in this recipe. I generally use 2.5 cups of water with one cup of basmati rice to make sweet pongal. If you prefer soft and mushy type pongal then you may use 2.75 cups of water. I have used diamond kalkandu (shown in the picture above) in this recipe. Add water to rice and cook it in a pressure cooker for 3 whistles. Meanwhile add saffron to milk and allow it to boil. Add the cooked rice and keep stirring. Simmer the stove and allow rice to cook in milk for 5-7 mins. Add powdered kalkandu and mix thoroughly. Remove the pongal from stove top and add cardamom – nutmeg powder. Heat ghee and fry cashews. 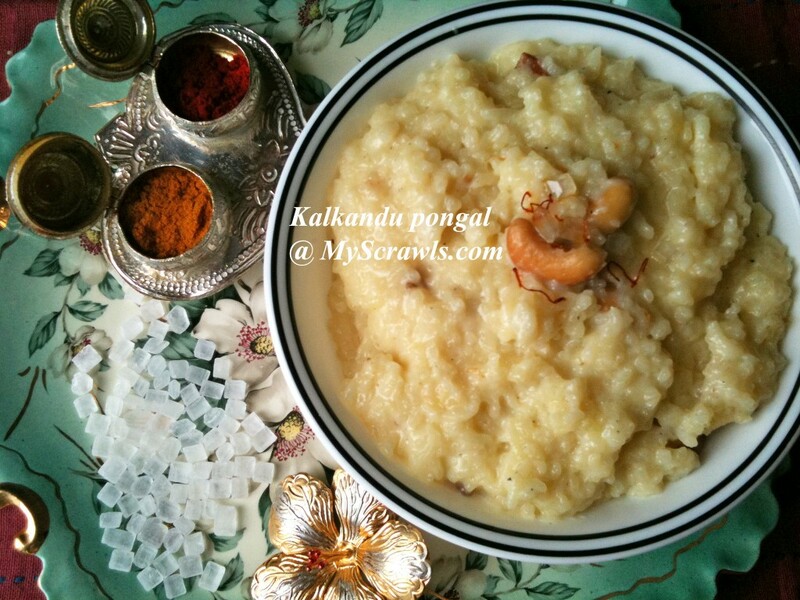 Add the ghee and cashews to Kalkandu pongal and mix well. Basmati rice for Sarkkaraippongal!What a bold move!0.25 cups of water makes all the difference bet pulav and pongal! Sarkkarai Pulav! I know how to go about it with the same tips!A Two in one!